As Batavia’s very own independent drugstore dedicated to serving the people of Genesee County since 1922, family-owned and operated Alberty Drugs provides personal customer service that’s second to none. We are a community leader in offering comprehensive and compassionate healthcare to meet all of your medication needs. We offer timely prescription delivery so that the medications you need are delivered to your home, when you need them. No more waiting in lines at the pharmacy or having to leave the house when you are not well – we come to you. 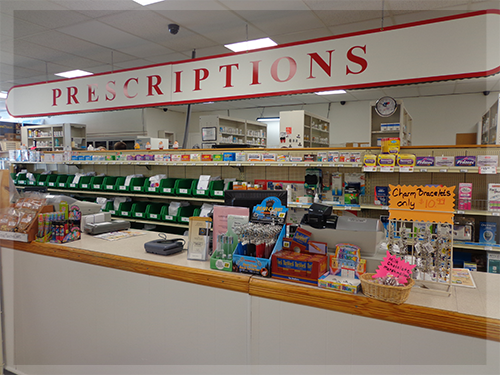 As the only locally owned drugstore in the area, we understand our community and provide customer service focused on your individual needs and concerns. Our friendly pharmacists are happy to answer your questions in person, over the phone, or through email, and we offer a greater range of pharmacy services, including compounding services, than any other pharmacy in the region. Our synchronized refill program means that your regular prescriptions will be automatically refilled on the same day each month without you having to think about them. Since we take care of the work for you, there’s no need to worry about whether you will run out of the medications you need or whether you remembered to refill your prescription. You can come directly to Alberty Drugs for affordable vaccinations including flu shots, recommended annually for adults 50 and over as well as for general protection against the influenza virus; pneumonia vaccines, recommended for adults over 65; and the shingles (herpes zoster) vaccine, recommended for adults over 60. It’s easy to make your vaccination appointment by calling or emailing us at your convenience, and we will help figure out whether the vaccines you need are covered by your insurance plan. If you have to take multiple medications, we help you more easily keep track of what to take when by providing Med Packs. These organize your medications by date and time of day, so you know exactly what medications you need to take in the morning, at lunchtime, in the evening, and before bedtime. Med Packs are clearly labeled, easy to open, and ensure that you won’t forget the timing of all your medications. We offer programs to help improve your medication adherence, which means we empower you to take charge of your health and keep you healthier longer! The caring staff at Alberty Drugs is here to help. We welcome your call about any of our services at (585) 344-1570, or you can email us at info@albertydrugstore.com and we’ll get right back to you.